You have probably been hearing a lot about omega-3 essential fatty acids lately, but what exactly are they? We have the facts on the health benefits of omega-3s and how to get more of them into your diet. Omega-3 is a type of essential fatty acid that is necessary for your body to function properly. It is found in oily fish and some plant oils. Omega-3s are in the family of “good” fats — polyunsaturated fatty acids (PUFAs). Because our bodies don’t produce them, we need to get omega-3s from our diet. Many people know that omega-3s can reduce the risk of heart attack and stroke because they keep your blood from clotting excessively, and reduce atherosclerosis (hardening of the arteries). However, the health benefits of omega-3s go far beyond heart health. Research has shown that omega-3 fatty acids, because of their anti-inflammatory properties, can help alleviate the symptoms of a number of ailments and conditions, including attention deficit hyperactivity disorder (ADHD), depression, hypertension (high blood pressure), joint pain and more. Additionally, studies indicate that omega-3s boost the immune system and help protect against a variety of illnesses, including Alzheimer’s disease and some cancers. Another benefit of omega-3s is their relationship with omega-6 fatty acids. Omega-6s are also essential fatty acids. They are found in foods such as baked goods, cereals, eggs, poultry and vegetable oils. Omega-6s offer positive health aspects too. They can help lower cholesterol and assist in blood clotting. They also play a role in brain function and development, metabolism and more. While omega-3 fatty acids are anti-inflammatory — controlling inflammation in the bloodstream, tissues and joints — omega-6s promote inflammation. It’s vital that the ratio between the two be in the range of 2:1 to 4:1 (omega-6 to omega-3) for optimal health. Unfortunately, most of us are probably closer to 20:1 in favour of omega-6. Therefore, it’s important to increase your intake of omega-3s to get closer to the proper balance. 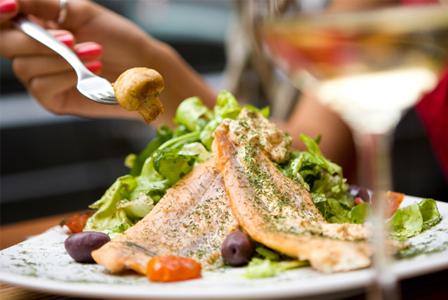 In general, we should all try to increase our intake of omega-3 fatty acids. However, there are some signs that may indicate you need more omega-3-rich foods. If you are suffering from dry, itchy skin, brittle hair and nails, fatigue and joint pain, you should try to increase your consumption of omega-3s. Additionally, those with cardiovascular disease, depression and diabetes would benefit from more omega-3 essential fatty acids as well. The three types of omega-3s are ALA, DHA and EPA. ALA (alpha-linolenic acid) is found in flaxseed, canola oil, soy products, nuts and more, while DHA (docosahexaenoic acid) and EPA (eicosapentaenoic acid) are mostly found in fatty fish. Research shows that omega-3s are better absorbed from food sources than supplements. 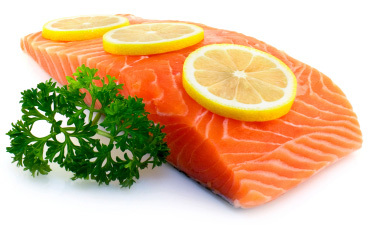 Omega-3 fatty acids are found in fatty fish such as albacore tuna, herring, lake trout, mackerel, salmon and sardines. Doctors recommend eating these fatty fish at least twice per week. Most experts agree that adults should have between one and four grams of omega-3 fatty acids each day for optimal health. For reference, one 4-ounce serving of wild Pacific salmon provides between 1.5 and 2.3 grams of omega-3. Fish isn’t the only source of omega-3 fatty acids. They are also found in walnuts, canola oil, some fruits and vegetables (broccoli, cantaloupe, cauliflower, spinach and others), kidney beans, grape leaves and flaxseed. Eating at least five ounces of these omega-rich foods twice weekly is essential to maintaining proper omega-3 levels. Though cod-liver oil and flaxseed pills can also supplement your omega-3 fatty acid intake, you should try to get omega-3s from food whenever possible.